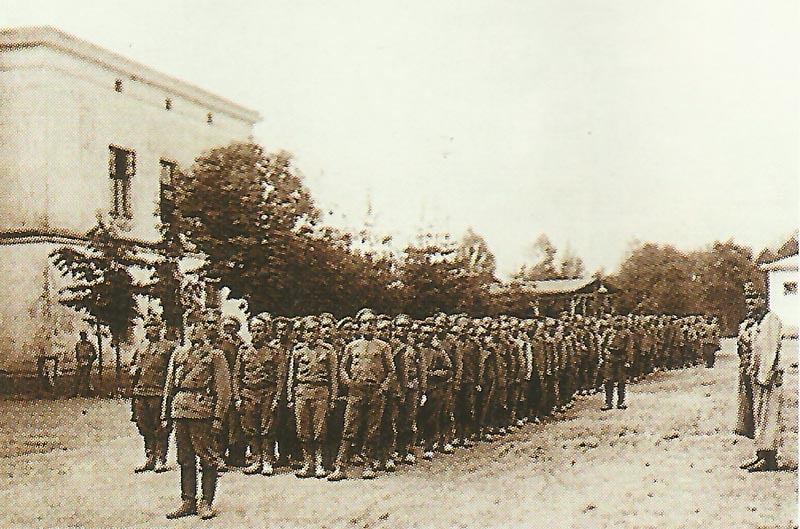 Russian PoWs in Austria. The hughe numbers becamoe more and more a problem. Germany claims 2 million PoWs (330,000 Anglo-French­-Belgian). Actually 726,694 Russians (August 10); Austria has 699,254 (September 1). Russia: Special Councils of Defence for Fuel, Food and Transport set up. Litzmann (Tenth Army) takes Kovno with 1,360 guns and 853,000 shells. Austro-­Germans approach Brest­-Litovsk as Russians being driven beyond river Bug. Italian Front: Italian advance on Bacher valley (Dolomites), Sta Maria and Lucia hills (Julian Alps). Gallipoli: Hamilton asks Kitchener for 95,000 men, meanwhile 8,500 more soldiers land at Suvla. Adriatic: 22 Austrian warships including 2 cruisers, 4 destroyers and torpedo boat shell Pelagosa and destroying its fresh water cistern forcing Italian evacuation next day. Italian submarine Jalea sunk by Austrian mine in Gulf of Trieste. North Sea: Harwich Force minelaying north of Heligoland aborted until next day by German destroyers torpedoed Royal Navy destroyer Mentor which could reach her base. Britain: 2 out of 4 Zeppelins sent cause 58 casualties in Kent, Essex and London (night August 17-18). Prince of Wales visits Argentina.